The name of this Italy tour—Gems of Umbria & Tuscany—says it all, as you’ll visit some of the medieval hill towns and see some of the beautiful gems that call central Italy home. 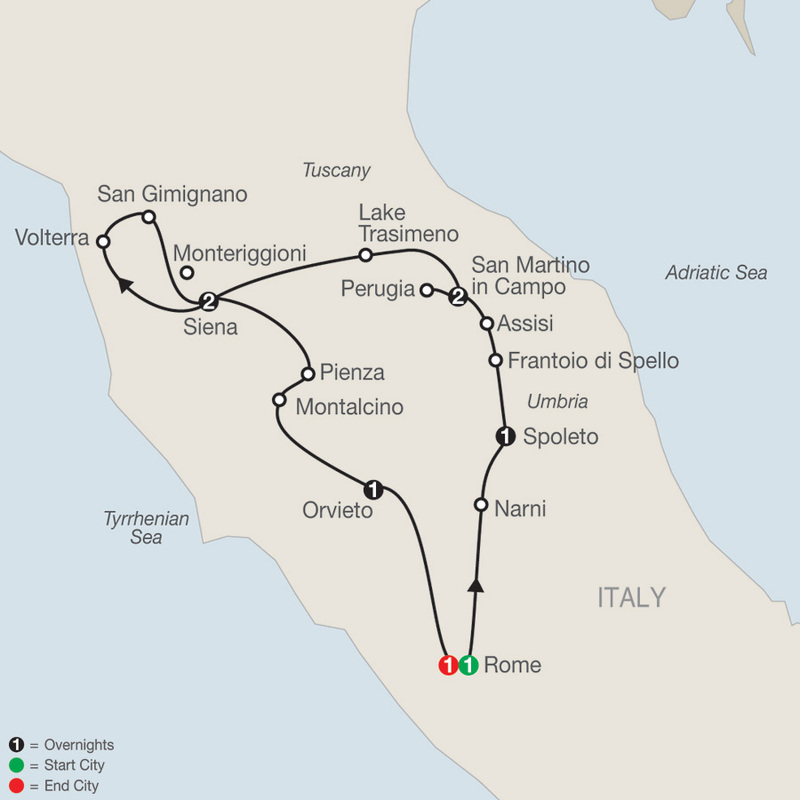 You’ll begin and end in Rome, and in between you’ll overnight in Spoleto, San Martino in Campo, Siena, and Orvieto. Of course, these regions are known not only for history, but also for wine and olive oil. That’s why we’ve arranged a Brunello wine tasting with lunch in Montalcino, beautifully located in the Tuscan Hills, and an olive oil tasting at an authentic mill in Frantoio di Spello—just two of the unique experiences offered by Globus! From the historic gems and the wonderful piazzas to the special adventures, this Umbria and Tuscany tour offers all of this and much more. A vacation of a lifetime! Welcome to Rome! At 5 pm, join your Tour Director and traveling companions, and leave the hotel for a welcome dinner at one of Rome’s lively restaurants. Your discovery of the green province of Umbria starts in the hilltop town of Narni, almost 800 feet high. Take a guided visit to the CONVENT OF SAN DOMENICO basement, and see a cell where prisoners of the Inquisition wrote graffiti on the walls. Then, a true highlight: learn the art of homemade Manfricolo pasta from a chef during a PASTA DEMONSTRATION, followed by lunch. Next is Spoleto, a former Roman city and capital of an important Lombard duchy from the 6th to the 8th centuries. During your walking tour with a Local Guide, take pictures of La Rocca, the former papal fortress that was used as a high-security prison until 1982; admire the Ponte delle Torri, erected on the foundations of a Roman aqueduct; and visit PIAZZA DEL DUOMO. This evening, dinner awaits at Vecchio Camino restaurant. You cannot leave Italy without trying one of its most important products. Attend an OLIVE OIL TASTING at an authentic oil mill at Frantoio di Spello. In Assisi, a guided walking tour includes visits to ST. CLARE’S CHURCH and ST. FRANCIS’ BASILICA, the hub of a religious order devoted to the ideals of humility, forgiveness, simplicity, and love for all God’s creatures. Arrive at your hotel in San Martino in Campo. Perugia is the capital of Umbria and an important university town. A guided walking tour features the PIAZZA IV NOVEMBRE, one of the grandest squares in Italy, graced by the Fontana Maggiore (Great Fountain). Admire the gothic cathedral, the Galleria Nazionale dell’Umbria, and Perugia’s stunning medieval municipal palace. Of course, you will taste Italy's most delectable Baci candy. An optional dinner outing is available. See some of Tuscany’s loveliest towns during this excursion: start with a visit to Volterra, a former important Etruscan center. Then visit hilltop San Gimignano, the most picturesque of Italy’s perfectly preserved medieval towns with its towers and encircling walls. 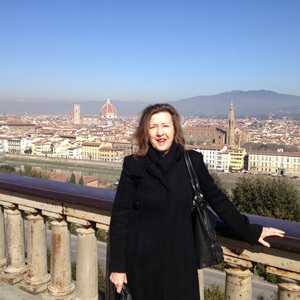 Return to Siena. Famous for pecorino cheese, Pienza has been listed as a UNESCO World Heritage Site, thanks to a member of the Piccolomini family who became Pope Pius II in the 15th century and redesigned the town in perfect renaissance style. Continue to Montalcino, beautifully located in the Tuscan Hills, for a Brunello WINE TASTING, followed by lunch with local specialties. On to Orvieto, perched high atop a volcanic rock, where a unique visit to the ETRUSCAN UNDERGROUND Labirinto (labyrinth) awaits. This evening, an exclusive dinner has been prepared by the famous Italian chef Maurizio. Hear the history of this fascinating town from your Local Guide during a pleasant walk through the narrow lanes and visit the CATHEDRAL with its San Brizio Chapel. Return to the “Eternal City” for a drive past some of Rome’s main highlights, and a farewell dinner with operatic entertainment at Tanagra restaurant to celebrate your journey to Umbria and Tuscany. Experience one of the most classical, well preserved, and best known medieval walled town, Monteriggioni, followed by a delicious dinner.